I took this morning off and went for my first flight of 2013. Something was wrong with my Bose headset or its batteries, so I had to do without noise cancellation, but it was a wonderfully-quiet flight in a different way. 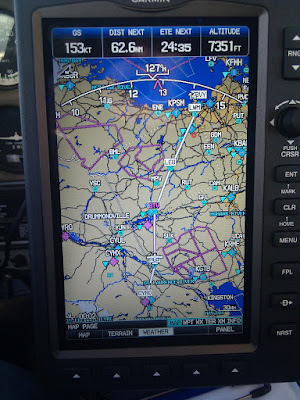 Normally, I mount a Garmin 696 portable GPS on my yoke, with a full-colour moving map, terrain and obstacle alerts, live satellite weather, nearby traffic alerts fed from a Zaon XRX, and even XM satellite radio. For a long cross-country flight, that stuff is very helpful, letting me see and plan for what’s happening 200 miles ahead and listen to the BBC to kill the long hours. It does, however, require a yoke mount and a complex series of power, antenna, and audio wires threaded carefully out of the way around the cockpit. I took off and followed frozen rivers around Eastern Ontario at 2,000 ft. I started without the map, but pulled it out for fun to identify towns and villages whose names I didn’t know (for the bigger ones, I just read the water towers). After 2 1/2 months without flying, my pre-flight skills were a bit rusty (I forgot to remove the pitot cover, and had to shut down and restart on the taxiway), but my stick-and-rudder skills were surprisingly good — the altimeter seemed to stay pegged on 2,000 ft even when I was distracted enjoying the scenery, wind-correction angles set themselves, etc. I don’t think I suddenly became a better pilot, especially after almost a full season away from the cockpit. My only conclusion is that I was less distracted. I’ve never been one of those fools who flies head-down playing with the toys instead of looking out the window, but still, every piece of information available to me is something my brain has to process, whether I’m consciously focussing on it or not. Without the GPS hurling groundspeed and heading at me, without the traffic system telling me there was another plane 2 miles away, without pictures of airports and airspace scrolling across a colour screen a couple of feet from my face, I simply didn’t have as much to think about. Modern avionics are great, and in many situations — complex airspace, IFR, etc. — they actually lower the workload. But for an easy VFR flight in familiar airspace, I think that leaving it packed away made me a better pilot. Further reading: Eight years ago, as a fairly new pilot, I posted about something similar for the instrument scan in Analog Flying. I strongly suspect that’s the best article — and possibly the only truly useful one — that I’ve posted in this blog. David: I am enjoying your posts very much and have just returned to flying after 30 years off to raise the kids. I have gained so much confidence from my Aera 500 yolk mount. The difference from 30 years ago when I had to struggle to know where I was at all times just from map reading is easy to get used to. Just a couple of weeks ago I did my first solo cross country in recent memory and was approaching a small airport on the Winnipeg River (Lac Du Bonnet CYAX). it is a single paved strip hidden by trees and I was approaching the N-S runway from the west. I confidently did all my calls at 10 miles, 5 miles, 2 miles but never saw the field until 1/2 mile. But I KNEW it was there and I was right on my navigation – a monkey could fly with a good GPS. Thanks, John. I flew from Ottawa to Winnipeg a couple of summers ago, and very much enjoyed the city (and the flight). The highlight was starting my return flight out of YWG before dawn, then watching the sun rise over Lake of the Woods on my way home. I have a similar memory. In my 35+-year-ago life, when I lived in Toronto, a friend and I flew her C-182 to Churchill. On the way back, we caught up to a cold front at S S Marie and a full day later we were stuck at Gore Bay – Manitoulin Island, waiting for the weather to clear. Finally, the next day we set off again for home. We climbed high for the water crossing from South Baymouth to Tobermory. The sun had not yet burned the fog off the Lake and below us the Chi-Cheemaun ferry had begun its southward crossing. The sun was shining brightly and sparkling off the wake. But, to my surprise, the ferry also made a wake in the fog. I had never had that vantage point before and was enthrawled! I have a Hunter 27 on Lake of the Woods, just east of Kenora. Want to come for a sail?